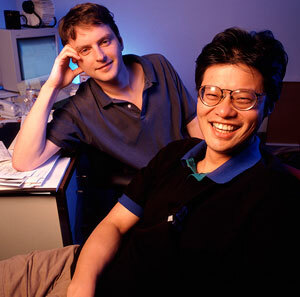 In the beginning of 1994 two Ph.D. candidates in Electrical Engineering at Stanford University—Jerry Yang (born November 6, 1968, in Taipei, Taiwan) and David Filo (born April 20, 1966, in Wisconsin) were looking for a single place to find useful Web sites and for a way to keep track of their personal interests on the Internet. As they didn't manage to find such a tool, they decided to create their own. Thus the now ubiquitous web portal and a global brand Yahoo! began as a student hobby and evolved into a site, that has changed the way people communicate with each other, find and access information. Filo and Yang started realization of his project in a campus trailer in February, 1994, and before long they were spending more time on their home-brewed lists of favorite links than on their doctoral dissertations. Eventually, Jerry and David's lists became too long and unwieldy, and they broke them out into categories. When the categories became too full, they developed subcategories, thus the core concept behind Yahoo was born. The Web site started out as Jerry and David's Guide to the World Wide Web, but eventually received a new moniker with the help of a dictionary. Filo and Yang decided to select the name Yahoo, because they liked the general definition of the word (which comes from Gulliver's Travels by Jonathan Swift, where a Yahoo is a legendary being): rude, unsophisticated, uncouth. Later the name Yahoo was popularized as an bacronym for Yet Another Hierarchical Officious Oracle. The Yahoo! itself first resided on Yang's student workstation, Akebono, (URL was akebono.stanford.edu/yahoo), while the software was lodged on Filo's computer, Konishiki, both named after legendary sumo wrestlers. For their surprise, Jerry and David soon found they were not alone in wanting a single place to find useful Web sites. Before long, hundreds of people were accessing their guide from well beyond the Stanford trailer. Word spread from friends to what quickly became a significant, loyal audience throughout the closely-knit Internet community. Yahoo! celebrated its first million-hit day in the fall of 1994, translating to almost 100 thousand unique visitors. The Yahoo! domain was created on January 18, 1995. Due to the torrent of traffic and enthusiastic reception Yahoo! was receiving, the founders knew they had a potential business on their hands. In March 1995, the pair incorporated the business and met with dozens of Silicon Valley venture capitalists, looking for financing. They eventually came across Michael Moritz of Sequoia Capital, the well-regarded firm whose most successful investments included Apple Computer, Atari, Oracle and Cisco Systems. Sequoia Capital agreed to fund Yahoo! in April 1995 with an initial investment of nearly $2 million. Like many other web search engines, Yahoo started as a web directory, but soon diversified into a web portal and a search engine. Realizing their new company had the potential to grow quickly, the founders began to shop for a management team. They hired Tim Koogle, a veteran of Motorola, as chief executive officer and Jeffrey Mallett, founder of Novell's WordPerfect consumer division, as chief operating officer. After securing a second round of funding in Fall 1995 and an initial public offering, Yahoo raised $33.8 million in April 1996, with a total of 49 employees. Here you can see the earliest known Yahoo! website from 1996. Today, Yahoo! Inc. is a leading global Internet communications, commerce and media company that offers a comprehensive branded network of services to more than 350 million individuals each month worldwide. It provides internet communication services (such as Yahoo! Messenger and Yahoo! Mail), social networking services and user-generated content (such as My Web, Yahoo! Personals, Yahoo! 360째, Delicious, Flickr, and Yahoo! Buzz), media contents and news (such as Yahoo! Sports, Yahoo! Finance, Yahoo! Music, Yahoo! Movies, Yahoo! News, Yahoo! Answers and Yahoo! Games), etc. Headquartered in Sunnyvale, California, Yahoo! has offices in Europe, Asia, Latin America, Australia, Canada and the United States.